…modern Latin, < flōrilegus flower-culling, < flōr(i)- , flōs flower + legĕre to gather; a literal rendering of Greek ἀνθολόγιον anthology n., after the analogy of spīcilegium; spiciˈlegium n.
1 b. A collection of the flowers of literature, an anthology. First OED citation: 1647. Spicilegium; † spicilegy n. [Latin spīcilegium] Obs. a gleaning; a collection or anthology. 1656 T. Blount Glossographia, Spicilegy, gathering ears of corn, gleaning or leising corn. Latin spīca ear of corn, spike n., occurring in a few words, as Mayne Expos. Lex. (1859) also gives spiciferous, spiciflorous, spicigerous as renderings of modern Latin formations. I am tempted to say of metaphysicians what Scaliger used to say of the Basques: they are said to understand one another, but I don’t believe a word of it. Camus thought him the most instructive of moralists, and far greater than La Rochefoucauld; Nietzsche and John Stuart Mill revered him; Pushkin read him and allowed Eugene Onegin to do the same; he is an admired presence in the diaries of Stendhal and the Goncourts; Cyril Connolly, another melancholy epicurean with a taste for aphorism, quoted him at length in The Unquiet Grave. 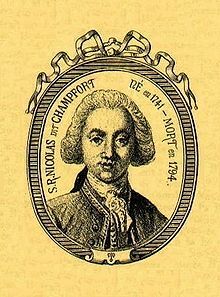 Yet Nicolas-Sébastien Roch de Chamfort (1741-1794) remains virtually unknown in this country. You imagine ministers and other high officials have principles because you’ve heard them say so. As a result, you avoid asking them to do anything that might cause them to break those principles. However, you soon discover you’ve been hoodwinked when you see ministers doing things which prove that they’re quite unprincipled: it’s nothing but a habit they’ve got into, an automatic reflex. When the Revolution broke out in 1789 he espoused the Jacobin cause, was among the first to storm the Bastille, spoke in public support of the revolutionaries, and coined slogans: “War upon the chateaux, peace upon the cottages”. When, as often happens with those who are early supporters of insurrection (especially when they have circulated in the privileged circles of the overthrown regime), he was denounced and imprisoned, and made botched and messy attempts at suicide, succeeding only in blowing out an eye with his pistol, and losing pints of blood when he attempted to slash his wrists, throat and ankles. Chamfort was ‘various, contradictory, but always stimulating, never one to flatter the reader’s complacency’. Camus described the Maximes as ‘a kind of disorganised novel’, which leads me to think of them as an extreme precursor of what has recently been called the ‘polyphonic novel’ (Michael David Lukas, ‘A Multiplicity of Voices: On the Polyphonic Novel’ in The Millions, 15 Feb., 2013; Ted Gioia, ‘The Rise of the Fragmented Novel’, Fractious Fiction website, 17 July, 2013). I intend to return to these two fascinating essays on modern narrative structure in another blog. 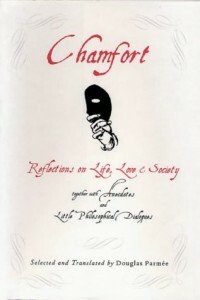 *Barnes was reviewing a new edition of selections from the Maximes: Chamfort: Relections on Life, Love and Society, edited by Douglas Parmee, published in 2003 by Short Books, 224pp. 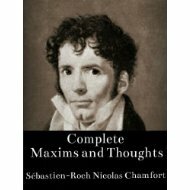 I see on the Amazon website there’s a ridiculously cheap 2012 Kindle edition of Complete Maxims and Thoughts (The Works of Sébastien-Roch Nicolas Chamfort) translated by Tim Siniscalchi. I haven’t checked to see if this is indeed ‘complete’ – Amazon state that this edition’s print length is 145 pages, which doesn’t sound long enough for completeness; they also have a Kindle edition in French which is free. a man fêted and pampered by the grand monde of the ancien régime—the very prototype of pensioned idleness and frivolous salon display—who all the time had been taking secret notes on this monde and bestowing drops of acid upon it. Here, moreover, was a parasite of the “great” who had welcomed the Revolution with open arms, with a euphoria as intense as his fate under it was to be horrific. Another review, by Neil Ascherson, was published 5 November, 1992 in The London Review of Books; some interesting comments from readers (reproduced on the website) add nuance. The blurb on the Amazon page for the English Kindle edition has this: “Chamfort”, wrote Balzac in a letter, “put whole volumes in a single biting phrase, while nowadays it’s a marvel to find a biting phrase in a volume” – a neat chiasmus to end on.